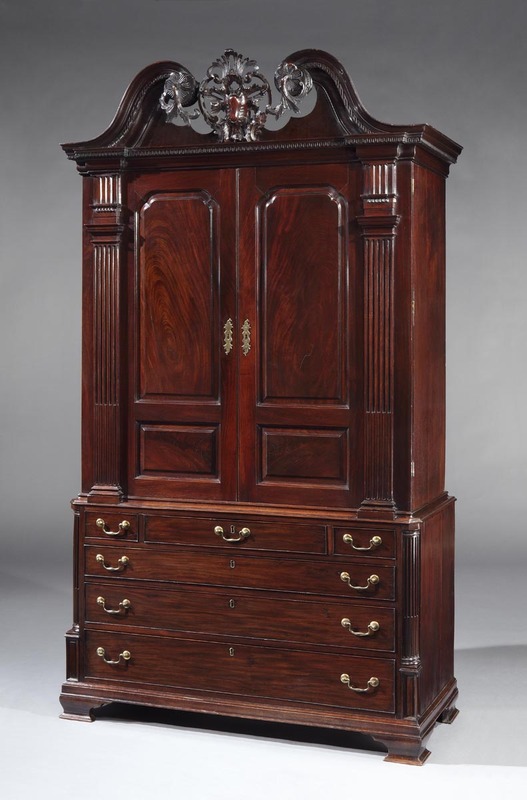 An Important Irish 18th century mahogany cabinet,the swan neck pediment with carved rosettes and trailing acanthus centered by a wonderful carved cartouche above moulded paneled doors with fluted pillars,the interior fitted with adjustable shelfs,the base section with three short and three long graduated drawers flanked by quarter columns, the top centre drawer with baize- lined writing slide opening to reveal a fitted interior beneath,raised on sweeping ogee bracket feet. Note: The shelves in the interior are replacements. The Knight of Glin and James Peil,Irish Furniture:Woodworking and Carving in Ireland from the Earliest times to the Act of Union,New Haven and London,2007 P.121 (fig.164) for an almost identical cabinet, probably supplied to Windham Quinn (1717-89)of Adare Manor,Adare,County Limerick around the time of his marriage in 1748 to Frances,the daughter of Richard Dawson of Dawson's Grove,County Monaghan,Sold at Christies Adare Manor sale, 9th June 1982, Lot No.320 (now in a private collection, Ireland) and another at Birr Castle, Birr, County Offaly.